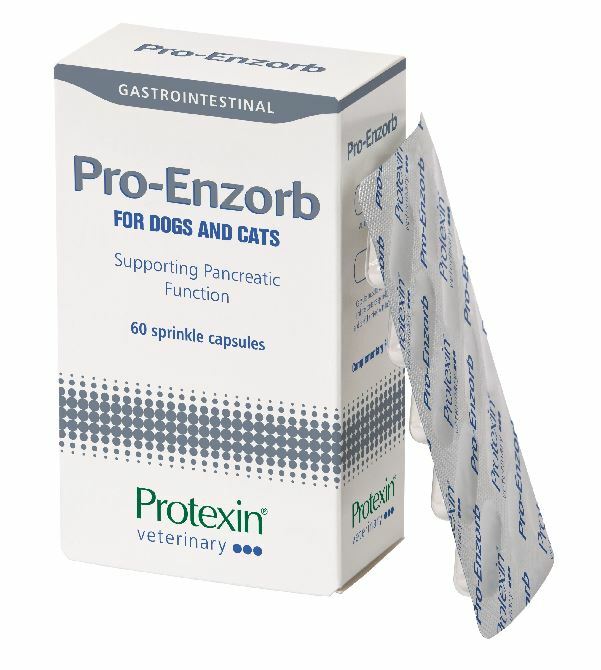 Protexin Pro-Enzorb is a supplement for dogs and cats which supports exocrine pancreatic function. It contains an active blend of three pancreatic enzymes - Lipase, Amylase and Protease, which are made into enterically-coated pellets which protect them from low pH levels in the stomach so they can reach the small intestine, where the digestive action is required. DO NOT ADMINISTER CAPSULES WHOLE! Capsules should be opened and the contents carefully mixed with food. The total daily amount should be divided equally between feeds. The quantity may be adjusted to achieve normal faecal consistency and/or appropriate weight gain. Note that the powder can be an irritant. It is advisable to wear gloves and wash hands after administration of the capsules. Below are some recent questions we've received regarding Protexin Pro-Enzorb for Dogs & Cats, including answers from our team. What's the weight of this product? Hi, what's the weight of this product? The product weight is 120g. Can the enzymes be sprinkled onto dry kibble and served immediately or should they be mixed with moistened food and left to incubate? The enteric coating of this product means that it is not active until it has been through the stomach and arrives in the small intestine. This is to protect the enzymes from the destructive acid found in the stomach. There is no benefit in mixing it with food and leaving it to incubate, it is designed to be mixed then eaten straight away.